The large full-width slider or image section on the homepage is the ‘Homepage Slider/Hero Section’ widget area. To make use of this widget area, first make sure to set one of your pages to be the static homepage in Settings > Reading > Your homepage displays. This widget area does not display on a homepage that is set to display your latest posts. To quickly and easily create a slider or a single image, add a standard WordPress ‘Image’ widget to the ‘Homepage Slider/Hero Section’ widget area, and upload/select an image to display. You can optionally enter a ‘Link to:’ URL for the image to link to. All images added to this section with the standard ‘Image’ widget will be automatically displayed full width, so we recommend you use suitably large images to prevent blurring. The image used on the Retail demo has dimensions of 1920×800 pixels. Should you have large images and are concerned that the file size may be very high, a free online image compression tool that we can recommend is TinyPNG or TinyJPG. This free tool can compress the file size of your images to ensure they load faster for your website visitors. Optionally give the widget a title or leave the title empty. If you give the widget a title, this will be displayed as large text in the center of the image. When adding or choosing an image, if you enter text as the image caption in the media editor, this text will be displayed over the image below the widget title. To create a slider, simply add additional ‘Image’ widgets to the ‘Homepage Slider/Hero Section’ widget area, and your images will automatically display as a slider on your homepage. You can also sort the image widgets into any order you wish to display the slides in that order. If you are adding additional images to create a slider, we very much recommend that all the images are of the same size or the same aspect ratio. Other third-party slider or image plugins can be used in this section if you prefer. Simply enter the plugin’s [shortcode] into the widget area using the standard ‘Text’ widget. Please consult your chosen plugin’s documentation for the correct shortcode to use. The static homepage can be configured to display any or all of the following sections. The WooCommerce plugin is required. The homepage displays the standard page content by default. 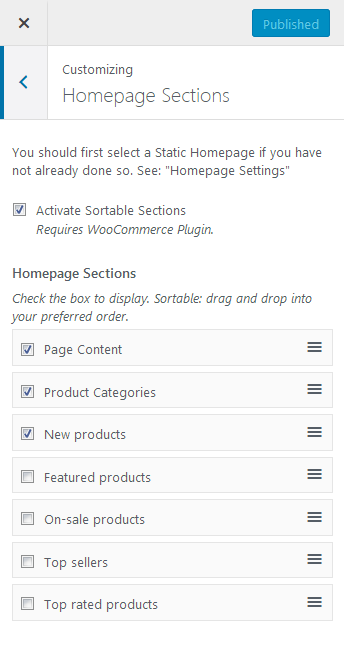 Please note that the product sections will not display if you have set the WooCommerce shop base page (the ‘Shop page’ in WooCommerce > Settings > Products) to be the same page as your site’s static homepage. To make use of the additional sections, check the box next to the ‘Activate Sortable Sections’ box. Once activated, you can check the box next to each section that you wish to display. The sections can be reordered by dragging and dropping the sections into any order. Grab the relevant section with the three-bar icon located to the right of each section.